Synthetic peptide within Human Telomerase reverse transcriptase aa 1100-1200 (C terminal). The exact sequence is proprietary. WB: HeLa cell lysate. IP: HeLa cells. Our Abpromise guarantee covers the use of ab32020 in the following tested applications. WB 1/1000. Detects a band of approximately 122 kDa (predicted molecular weight: 127 kDa). Expressed at a high level in thymocyte subpopulations, at an intermediate level in tonsil T lymphocytes, and at a low to undetectable level in peripheral blood T lymphocytes. Defects in TERT are a cause of dyskeratosis congenita autosomal dominant (ADDKC) [MIM:127550]; also known as dyskeratosis congenita Scoggins type. ADDKC is a rare, progressive bone marrow failure syndrome characterized by the triad of reticulated skin hyperpigmentation, nail dystrophy, and mucosal leukoplakia. Early mortality is often associated with bone marrow failure, infections, fatal pulmonary complications, or malignancy. The primer grip sequence in the RT domain is required for telomerase activity and for stable association with short telomeric primers. The RNA-interacting domain 1 (RD1)/N-terminal extension (NTE) is required for interaction with the pseudoknot-template domain of each of TERC dimers. It contains anchor sites that bind primer nucleotides upstream of the RNA-DNA hybrid and is thus an essential determinant of repeat addition processivity. The RNA-interacting domain 2 (RD2) is essential for both interaction with the CR4-CR5 domain of TERC and for DNA sythesis. Nucleus > nucleolus. Nucleus > nucleoplasm. Nucleus. Chromosome > telomere. Cytoplasm. Nucleus > PML body. Shuttling between nuclear and cytoplasm depends on cell cycle, phosphorylation states, transformation and DNA damage. Diffuse localization in the nucleoplasm. Enriched in nucleoli of certain cell types. Translocated to the cytoplasm via nuclear pores in a CRM1/RAN-dependent manner involving oxidative stress-mediated phosphorylation at Tyr-707. 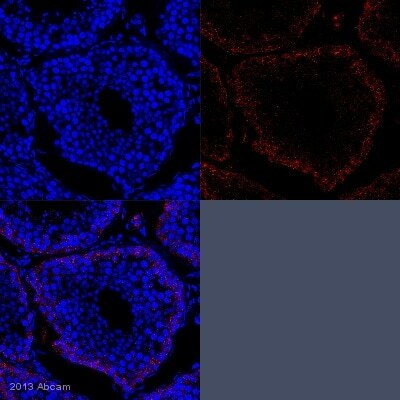 Dephosphorylation at this site by SHP2 retains TERT in the nucleus. Translocated to the nucleus by phosphorylation by AKT. ab32020 (purified) at 1:100 dilution (2µg) immunoprecipitating Telomerase reverse transcriptase in HeLa whole cell lysate. Publishing research using ab32020? Please let us know so that we can cite the reference in this datasheet. She would use this on human samples for IF. our customer is working with cells. https://www.abcam.com/index.html?datasheet=5181 (or use the following: https://www.abcam.com/index.html?datasheet=5181). ab5181 Anti-Telomerase reverse transcriptase antibody [2C4]has one reference with the use in ICC. https://www.abcam.com/index.html?datasheet=32020 (or use the following: https://www.abcam.com/index.html?datasheet=32020). 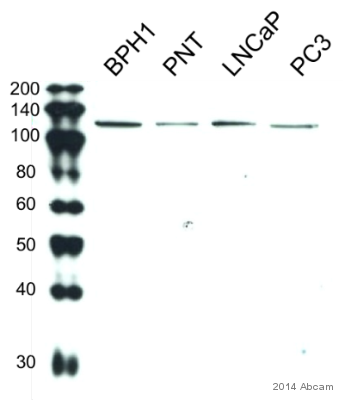 ab32020 Anti-Telomerase reverse transcriptase antibody [Y182]has two customer raitings and one reference for the use in ICC. I'm looking for a telomerase antibody that may cross-react with dog. Unfortunately we do not have any telomerase antibodies tested and known to cross-react with dog. However, we have some telomerase and telomerase reverse transcriptase antibodies that showed some sequence homology with dog. Generally we say anything with > 85% sequence homology should cross-react, so we have a few that are right on the edge. I hope this information is helpful to you. Please do not hesitate to contact us if you need any more advice or information of if you'd like to participate in the AbTrial. Is there any difference between the following products or are they same? Thank you for contacting us. Yes, this is the same product. Epitomics is now part of Abcam so you will see the same products in our catalog from theirs. Please let me know if you have any further questions. Nos sigue sin salir la expresión nuclear del h-tert aun cambiando las condiciones y siguiendo los pasos que nos dijisteis. Y cómo me comentásteis que no había opción de teñirlo vosotros pero sí de mandar otro anticuerpo. He estado mirando el catálago el ab5181 y he pensado que al ser monoclonal igual sí nos sale. Qué te parece? Habría opción de que lo mandárais o cómo debemos hacerlo? Bueno ya me comentas que opciones tenemos porque de verdad que me interesa mucho su expresión en sarcomas de Ewing. Siento mucho que no consiguierais solucionar los problemas de tinción del anticuerpo. No hay ningún problema en mandaros de forma gratuita el anticuerpo ab5181. Este anticuerpo se ha validado en IHC-P (con tejidos humanos) dando buenos resultados, y por tanto también está garantizado (durante 6 meses) en esta aplicación. Si me confirmas que deseas recibirlo realizo de inmediato el pedido para que os llegue cuanto antes. Espero entonces tu respuesta para poder solucionar este inconveniente. Gracias por tu colaboración. No bands observed in blots of cancer cell lysates; previous vials have worked well. Thank you very much for your interest in our antibodies. 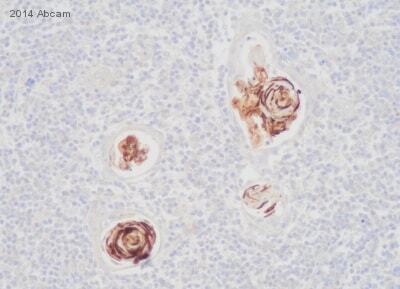 As an Oct4 antibody, I can recommend the ab19857 for use in ChIP. It has been tested to workgoodin ChIP andto recognize thehuman, mouse and rhesus monkey protein. https://www.abcam.com/index.html?datasheet=19857 (or use the following: https://www.abcam.com/index.html?datasheet=19857). To detect DNMT3B in ChIP, we dohave three antibodies tested and guaranteed thus in ChIP (ab13604, ab2851, ab122932). I canrecommend theab13604, which is testedagainst the human and mouse protein and is also cited in several publication. https://www.abcam.com/index.html?datasheet=13604 (or use the following: https://www.abcam.com/index.html?datasheet=13604). In regards to the anti Telomerase reverse transcriptase antibody, we do currently not have an antibody which is tested in ChIP. However we can provide you with a testing discount if you would like to test one of our anti Telomerase reverse transcriptase antibodies in ChIP. Please see here below for the details of this offer. For example the antibody ab32020 has already been tested in immunoprecipitation and many other applications, such as WB, ICC/IF, Flow Cyt, IHC-P, ICC, IHC-Fr. It is therefore likely to work in ChIP, although we can not guarantee it. The ab32020 has been tested already against Cow andHuman. https://www.abcam.com/index.html?datasheet=32020 (or use the following: https://www.abcam.com/index.html?datasheet=32020). I hope this information is helpful. Please do not hesitate to contact me again, should you have any other questions. If you would like to test the ab32020 in ChIP, I can offer a discount off a future purchase if you buyab32020 now, test it inChIP and submit feedback to us in the form of an Abreview. It doesn’t matter whether the Abreview is positive or negative, we would just really like to receive your feedback. 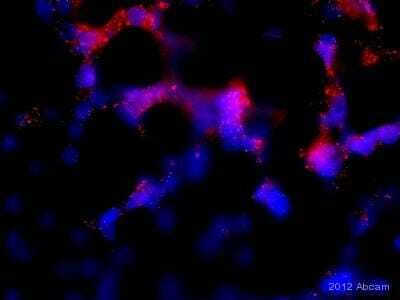 The discount would be to the value of: 1 free primary antibody. 1. Reply to this e-mail to let me know that you would like to proceed and testab32020 in ChIP. I will then send a discount code. This code must be issued before purchasing ab32020 so please wait for my reply before ordering. 2. Purchase ab32020 either by phone, fax, or online (www.abcam.com). We are always pleased to obtain feedback about our products and any information is greatly appreciated! Even if ab32020 turns out to be unsuitable for ChIP, you will still receive the discount on your next purchase after your Abreview has been submitted.